One of the most annoying and probably frustrating things that happen during winter is ice damming. During freezing temperatures snow and ice are likely to get collected on the roof. If the interior of the house is poorly insulated, the heat reaches the roof and melts the ice. However, as the water flows down, it freezes in the gutter and leads to ice damming. This prevents snow melt from flowing and thus may compromise the quality of the roof’s shingles. The only method to prevent ice dams is to keep the roof warmer all through. And while ventilation and insulated attics may not work, a heated gutter system will do the job. Incorporating, self-regulating gutter heat cables and heated gutter helmets, ice damming may be a thing of the past. Heat cables can be directly installed in the gutters, in which they can be installed on the edge of the roof for extra protection. The heat cables are used to help in the reduction of ice formation. It is, therefore, crucial to understanding that heat cables are designed to assist in the removal but not prevent ice dams. Heat cables come in two forms; traditional heat cables and thermostat or self-regulating heat cables. The thermostat heat cables allow the owner of the house to control temperatures while the traditional one maintains a constant temperature. The main task of heat cables is to enable water to escape by heating the ice formation from underneath hence making tiny tunnels that allow water to escape. While the name may suggest heating, this product is in the real sense not ‘heated’ but needs the use of heat cables. This product is installed directly over the heated cables and functions in 2 ways. The first way to assist in the prevention of debris collection in the gutter which may lead to clogging. The second function is to heat up during winter to melt down the layers of snow on the roof to prevent damage. Why Invest in Heated Gutters? Although there are various ways to prevent ice damming, no method is more convenient than heated gutters. Removing icicles can be a dangerous undertaking and also a pain especially during winter. Additionally, chipping or digging through ice dams can be not only tedious but also compromise the quality of their roof and not mentioning the amount of salt needed to melt an ice dam. Also, climbing on the roof during winter can pose a life threat considering the roof is wet and slippery. 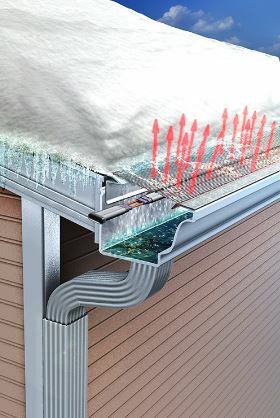 One major observation in heated gutters reviews is that the systems afford the user both comfort and convenience without worrying about the snow clogging the gutter. It also increases security by eliminating threats such as falling icicles which could harm someone, or someone falling from the roof which clearing an ice dam. How to Get Heated Gutters Installed? What many heated gutter reviews do not reveal is how to install heated gutters, and that is because one needs the services of a professional company to do it. Good installation means the gutter systems will last longer. Beaverton Gutter Pros Company located in Michigan are the best at both gutter cleaning and heated gutter installations. The company is always happy to help house owners install gutter helmets and offer them gutter installation instruction to minimize any risks or injury. For questions or more information on heated gutter installation packages, do not hesitate to contact our company today for the best services that will be worth every penny.